Earlier this week, I was asked to talk to PhD students at American University as part of a panel about the academic job market. I wanted to share a few thoughts from that panel for those who couldn’t make it. These observations are, of course, based on my own experiences, which probably aren’t typical. However, during that process, I also sought out advice from dozens of professors and colleagues. In particular, however, I want to focus on what the academic job market looks like for first-time applicants who are graduating from non-elite doctoral programs (that is, outside the privileged circle of ten or so programs from which the majority of new, tenure-track professors are hired), and especially those with degrees in International Relations. The market is tough, but it’s not hopeless! 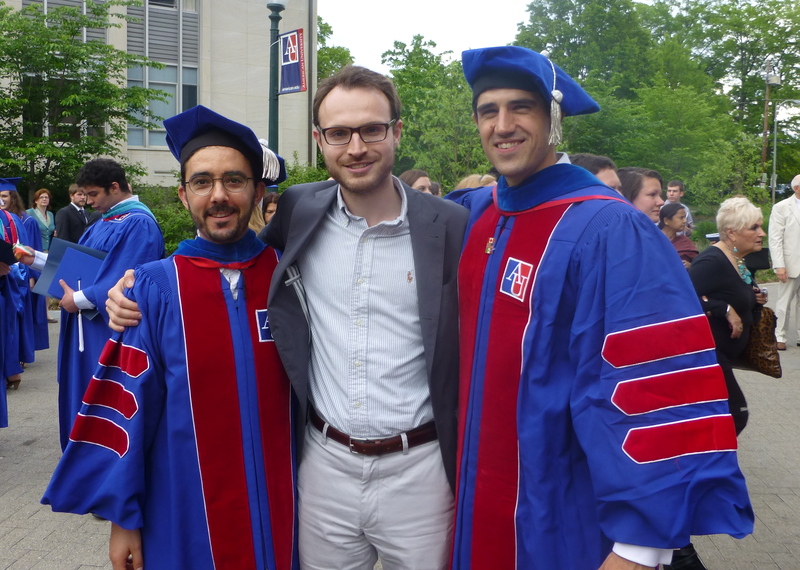 With my classmates, Sebastian Bitar and Ryan Briggs, now on faculty at Universidad de los Andes and Virginia Tech, respectively. I applied for about 75 positions over a three-year period. I would say that I was semi-selective about where I applied (that is, I wasn’t automatically firing off applications to every vacancy). I customized every one of those applications to at least some extent. Keep in mind, this takes a lot of time. About 35 of those applications were to tenure-track or permanent jobs. About 20 were for fellowships and postdocs. About 15 were for visiting/term positions. I received three interviews (and three offers) for permanent positions, though none was at a traditional academic institution in the United States. Two were abroad. I was interviewed for one postdoc, also abroad (no offer). I interviewed for four visiting/term jobs (two offers, including my alma mater in odd circumstances). First, this is not your advisor’s job market. It is increasingly competitive, with almost every U.S. tenure-track position being flooded with hundreds of applications. Secondly, if you are at a non-elite institution, your advisor probably has Ph.D. from a higher-ranked place than you. If you are in an IR program, odds are that your advisor has a doctorate in a traditional discipline. Both of these things matter, especially for U.S. jobs. In this circumstance, as I was reminded by honest senior colleagues, no one is going to give you the benefit of the doubt based on your Ph.D. Secondly, an IR degree is going to have a steeper climb in many U.S. disciplinary departments. This is definitely the case in many political science departments. So be prepared to make a case about how you fit into the discipline. Get used to rejection. You have to be able to read a rejection letter from a job you really wanted, pause 15 minutes, then get back to applying and writing. Most likely, the rejection is not a reflection on you. Questions of fit are always paramount, and it can be hard to know what departments are really looking for, even when the ad seemed specific. Be willing to be mobile. Given the amount of competition, you might need a couple of years to really distinguish yourself. This likely means one-year fellowships or assistant professorships. Though it might be easier (particularly for your personal life) to stay at your degree-granting institution, it is really important to get a different institution’s name on your CV. At one point, I had two offers at the same time, along with a third to return to a term position at American University. Everyone I asked emphasized the importance of moving elsewhere. It shows that people who didn’t know you as a student also think you are a valuable colleague. Think globally (after all, you studied International Relations). Of course, family reasons may preclude these options for many people, but you might be more competitive abroad. In many countries (in my experiences, Mexico and the UK), IR Ph.D.s are more readily accepted. Many UK departments are “Politics and International Relations,” with fairly equal billing. Stand-alone IR departments might be more common abroad, too. In the United States, they are often newer, more professionally focused, and may still favor traditional disciplines in their hiring. What do you need to get a position? Most likely, you need a degree in hand. You should apply for some positions (especially postdocs) as an ABD, but know that your odds are much slimmer. There are simply too many people on the market with degrees for universities to take a chance that you won’t finish in time to start the position. A research pipeline. Having a signature publication is key, but showing that it isn’t a one-off is also important. Think about demonstrating that you have more to come. Ideally, some of this should demonstrate a post-dissertation research agenda. Ideally, you would apply with an article published or forthcoming, a revise-and-resubmit, an article under review, and a manuscript tagged “in preparation.” These have a declining value, but together they show that you have a stream of research. You won’t have all of these steps all the time, but I think it is a good model. Some teaching with evaluations. You don’t need a lot, but having some teaching experience will be helpful. My sense is that two or three different classes is about right. After that, the job market returns diminish rapidly. Recommendations. You need the letters, but what you really need are senior colleagues who will pick up the phone and call people they know. Identify the jobs you really want to avoid burdening them, and try to find connections. Don’t limit yourself to your committee. Reach out to anyone with an interest in your success. If some of these people are at other universities, that can also be useful. Avoid just about everything else to the extent you can. Think carefully about accepting extra responsibilities as you near the market. Be a good colleague, but above all be cognizant of the opportunity costs. By tsl2m5 in Uncategorized on October 2, 2015 .